I’m trying to imagine a scenario in which I actively seek out information and I’m glad not to be able to get it. I’m trying to imagine how many times a day I ask for information—large requests and small, cries for help and two-second Google searches—and out of those how often I’ve been happy to receive nothing useful in return. In writing this, I’ve used a search engine about 32 times, I’ve read about six different articles on six different websites, twice I shouted at my wife for help with a word, and once I texted a friend of mine because I couldn’t remember what “ontological” meant in context. Each time I received an answer; each time the world became a slightly clearer place. This isn’t particularly creative editing. Spend 90 seconds on the awesome @philsimmsquotes Twitter feed and you can find dozens of other examples of Simms’ brand of mental stultification–the mid-sentence contradictions, the misunderstanding of the rulebook, dozens of dada-like telestrations, sentences that trail off into the ether. 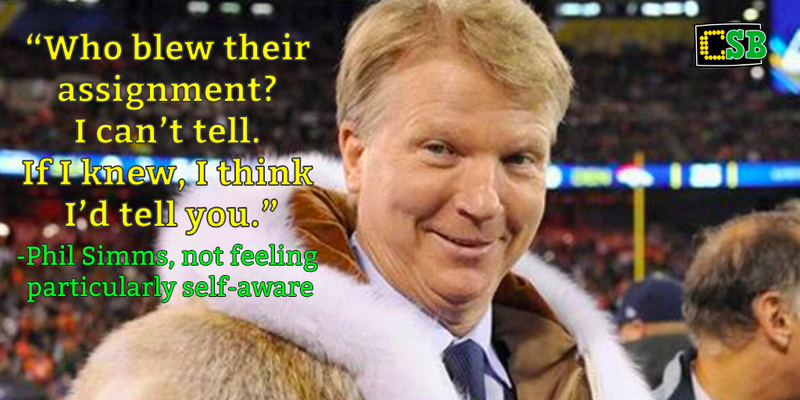 Phil Simms uses iterations of the phrase “talked about”–“We talked about it,” “they talked about it,” “When we talk about,” etc.–so often that drinking games–really, really difficult drinking games–have arisen as a Simms companion piece. And the rules are: when Simms “talked abouts” it, you drink. If you were playing along during the 2015 AFC Championship, you would have drunk 17 times. If you were playing along when the Broncos played the Chargers on January 3rd, you would have drunk 26 times. And if you were playing on January 20th, 2013–when the Broncos defeated the Patriots in the AFC Championship–you would have drunk 39 times (and ended up in the hospital, or worse). In other words, he’s very bad at what he does. By most accounts, Phil Simms had a terrible Super Bowl in 2013. In many ways it was a kind of Phil Simms highlight reel. He was slow to reply to Nantz, he was adrift in his own absolutely grammarless sentences, he corrected and re-corrected himself throughout CBS’ numerous instant replays, and the totality of his response to the 34-plus minute blackout came in the form of a groaner about powering up his cellphone. But it isn’t surprising that Simms was bad—he’s historically bad (and CBS’ coverage of football is notoriously terrible)—what remains surprising is that three years later he has once again been asked to call the 2016 Super Bowl. Here I’d offer the seemingly obviously tautology: that if an analyst is not able to offer any analysis—is not able to offer scope or context, is not able to offer timely criticism or explanation of situational football, is not able even to explain the application of the rulebook or to narrate a slow-motion replay as it is playing back–then what is it that an analyst is left to do except be a kind of wide open mouth, a white noise machine, a kind of sports iteration of the proverbial George Saunders’ Braindead Megaphone? What is it that CBS is doing here? Insofar as all analysts are fungible—insofar as the NFL is basically ratings-proof—then there is no economic incentive to keeping Phil Simms in the booth. There is only an aesthetic incentive. And perhaps an ontological one. 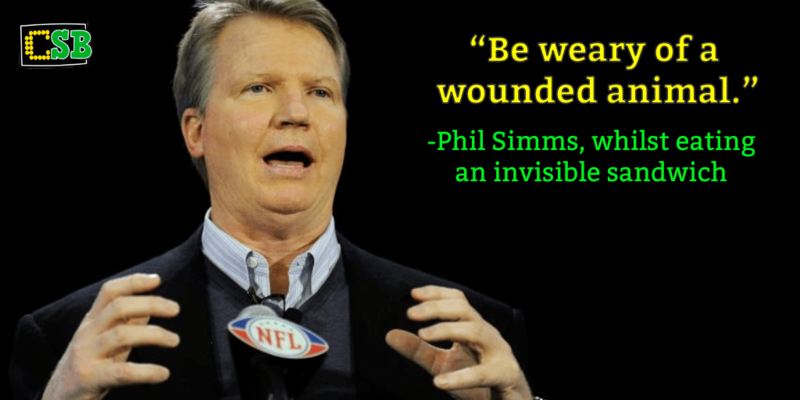 Phil Simms is who CBS wants because Phil Simms himself is an absolute expression of perspective from CBS–the CBS world should look and sound like Phil Simms, and manipulate language like Phil Simms, and express curiosity like Phil Simms. 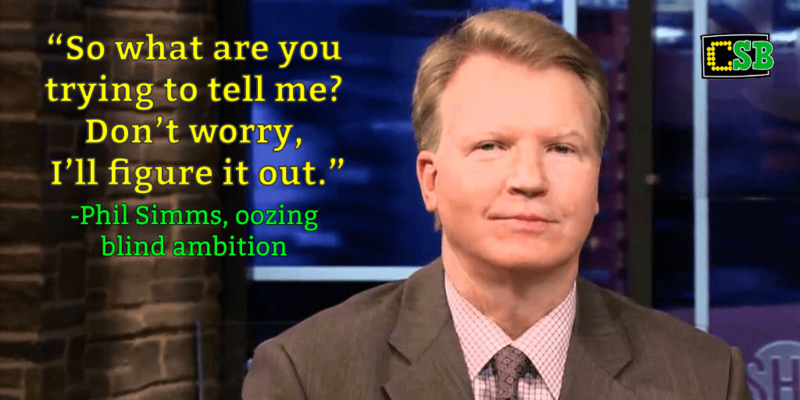 That Phil Simms is the perfect representation of the CBS lifestyle. Kindly. Oafish. Ill-informed. Little else. And so he is, and so are we too for watching. CBS keeps Phil Simms employed because in all CBS endeavors it’s less expensive to be simple than to be smart, because it takes times and money to explicate the underpinnings of the NFL, and because it’s easier to trade in the tropes of traditional narrative than in the actual mechanics of the world. There are 22 men running in different directions +/-120 times in a football game, each of those +/-2700 separate movements are diagrammed in a 300-page playbook which is choreographed and implemented by a team of coaches each charged with evaluating situational leverage, success percentages, risk ratios, and the constant, ever-changing impact of time. NBC’s weekly Football Night in America production takes it all on and can be wonderful—and complicated, and sophisticated—but it’s also expensive. And in a world where, say, two networks are paying the same amount of money for the same games, and at a time when it’s hard enough to sell “smart”, sometimes in America it makes more sense to pump cash into an empty bag of flesh than to take the time to learn anything. Mike Simpson is one of the most talked-about sportswriters on the web. You should follow him on Twitter.